Well, what a Designer. Thierry was born on Strasbourg and moved to Paris when he was 24 years-old. He launched his first collection in 1973 and called it "Café de Paris". 5 years later, he opened his first boutique in Paris and in 1992, as a request of the Chambre Syndicale de la Haute Couture he launched his first haute couture collection. changed the name of the brand to "MUGLER". made Lady Gaga entering on a runway and that was a huge success. Mugler's clothes are completely insane, full of movement and very conceptual. He plays with forms, cuts, patterns, tissues and many materials (the blue coat ant trousers you can see on the upper photo are made of latex). For men, Mugler designs a structured silhouette of the men's shoulders, they are classic and anatomic at the same time. For woman, he designs lots of dresses, with high fashion cuts, modern, actual and chocking but still classy. But, at the same time, he stays very conceptual, with eccentric and wacky designs. Bom, que criador! Thierry nasceu em Strasbourg and mudou-se para Paris quando tinha 24 anos. Lançou a sua primeira colecção em 1973 chamada "Café de Paris". 5 anos depois, abriu a sua primeira loja também em Paris e em 1992, a pedido do Chambre Symdicale de la Haute Couture, lançou a sua primeira colecção de alta costura. 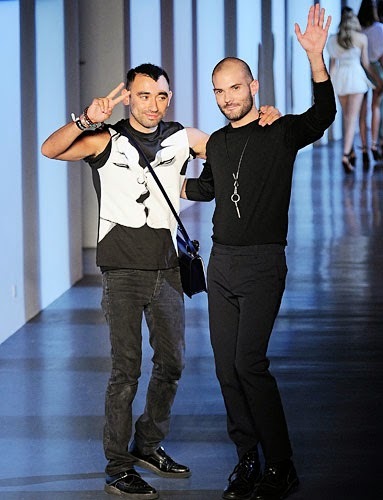 Em 2010, Nicola Formichetti, assumiu o papel de Director Criativo e modou o nome da marca para "MUGLER". Nicola também fez a primeira colecção masculina da marca e convidou a Lady Gaga para desfilar, fazendo o maior sucesso. 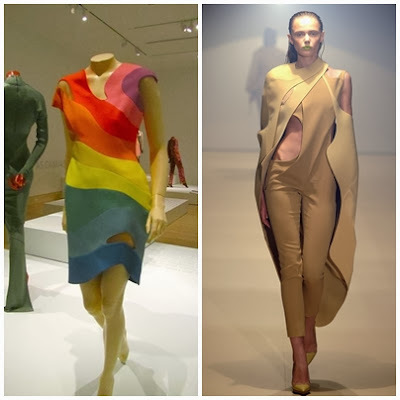 As criações de Mugler são completamente loucas, cheias de movimentos e super conceptuais. Ele brinca com formas, cortes, padrões e imensos materiais (o casaco azul e as calças que podem ver nas fotografias em cima são feitas de latex). Para homem, Mugler desenha uma silhueta estruturada dos ombros masculinos, são clássicos e anatómicos ao mesmo tempo. Para mulher, desenha imensos vestidos, com cortes high fashion, modernos, actuais, chocantes, mas sempre classy.